Gregory IX (Ugolino di Conti). Decretalium d[omi]ni pape Gregorij noni co[m]pilatio accurata dilige[n]tia eme[n]data su[m]moq[ue] studio elaborata et cu[m] scripturis sacris aptissime c[on]cordata. Basel: Johan Amerbach for Johannes Froben, 1500. 17 cm. Seventeenth-century vellum over boards. This work, with the Decretum of Gratian, the Decretales of Boniface VIII, and the Decretales of Clement V constitute what has for centuries loosely formed the Corpus juris canonici -- the canon law counterpart to Corpus juris civilis. Early editions of all of these works are held by the Tarlton Law Library. St. Raymond of Peñafort (1175-1275) a native of Barcelona, studied law at Bologna. In 1222 he joined the Dominican Order, and shortly thereafter (1229) was called to Rome to serve as the Grand Penitentiary (the chief canonist) by Pope Gregory IX (1145-1241, in office 1227-1241). At the request of the pope, Raymond began compilation of canon law from Gratian to the current pontificate. He drew on the structure of Quinque compilationes antiquæ -- five collections of pontifical legislation from the Decretum of Gratian to the pontificate of Gregory IX, roughly 1150 to 1227. These compilations provided the text for canonical instruction at the University of Bologna. Raymond’s new compilation, which took four years to complete, is known as the Liber extra, Liber sextus, or simply the Decretales of Gregory IX. The work contains 1971 chapters -- 1771 are from the Quinque compilationes antiquæ, 191 are from the pontificate of Gregory IX, seven are decretals of Innocent III not appearing in earlier collections, and two are of unknown origin. Issued in 1234, the work superseded all earlier collections of canon law. St. Raymond of Peñafort is the patron saint of canon lawyers. This copy adds to Tarlton Law Library's growing collection of incunabula (books printed before January 1, 1501.) This particular copy was printed throughout in black and red by one of the great early printers in Basel. The text appears in the middle of the page surrounded by the commentaries of Sebastian Brant. Decorated hand-painted puzzle initials in red and blue appear in the prologue and at the beginning of each section. 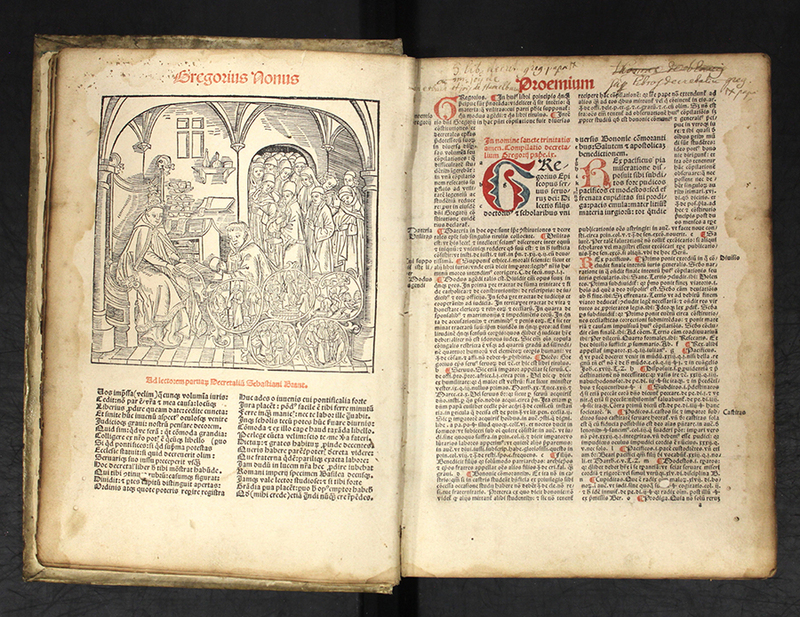 Shown is a woodcut of Gregory IX and the beginning of the prologue.